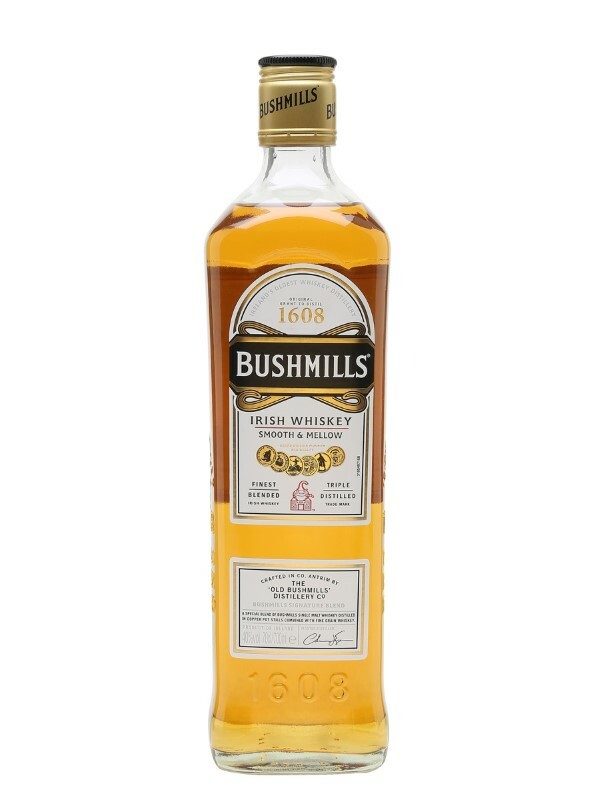 Bushmills Irish whiskey is the original and best known whisky from the Old Bushmills Distillery, the oldest licensed whisky distillery in the world. Its is a blend of single malt and single grain whiskey. Grain whiskey reserved for Bushmills is aged a minimum of five years in oak casks that are specially selected to bring out the golden hue and light. When mature this grain whiskey is blended with a single malt whiskey to balance the flavour. The malt used in Bushmills mash derives its clean taste from the deliberate absence of peat used in the barley drying process. Irish whiskey distilleries kiln-dry their malt in a heat-fired, not peat-fired, oven. Lighter, no smoke and perfectly balanced, Bushmills is triple distilled for exceptional smoothness.